Santiago, Chile, November 2016. 11 humans, an earthquake and several dishes of wild eel. The basic ingredients for a weekend full of discussion, of debate—and not always in consensus, and final deliberation. By the end of the weekend, this talented group selected the Finalists for the 2017 Interaction Awards! The entries this year were diverse and covered a much broader range of topics. The 2017 shortlist stood out to us as the projects mostly characterized as heavyweight problem-solving. From crime-fighting to workers rights, immigration issues, or even to help people with disabilities create music—there were a lot of fantastic design approaches to important topics. With that in mind we invited our six jury members to the Santiago office of Continuum, who graciously hosted us and provided a space to deliberate and a constant supply of coffee. We started reviewing the shortlisted entries in pairs, two jurors covering two awards categories. Big thanks to Christian Svanes Kolding, our director of the short films, who captured the jury’s deliberation, process, and conclusions in selecting the finalist and winners in each category. On Sunday, the focus shifted to selecting our special awards recipients: Best in Show, Best Concept, Best Student, the People’s Choice and the Future Voice Award. We’re excited to reveal all the winners at next year’s conference in New York, where we will celebrate and honor some of the best design work around the globe. 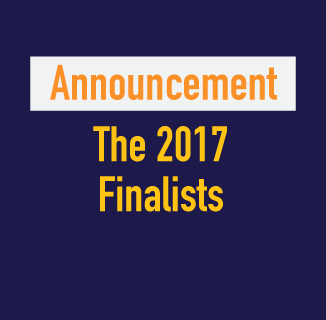 Without further ado, we’re incredibly proud to present this year’s Finalists. The final question will be, who will win in each category? You’ll have to see for yourself in New York City on February 8th. Up next: People’s Choice voting will open early January 2017: All shortlisted projects are eligible. Stay tuned for details! Its great to be a Finalist! Congrats to all of the amazing IX teams selected. Hello! Muchas Gracias! Its great to be a Finalist! Congrats to all of the amazing IX teams selected.